First, a huge and happy shout-out to my Instagram buddy, @mycoffeepot. Gerald provided me with generous samples of Sailor Bung Box Sapphire and Penman Sapphire. He’s a fountain pen nerd (in the best way possible) and if you’re not following him on Instagram, you should be. Second, let me tell you how I worked this thing: I loaded up four Pilot Metropolitan (medium nib) fountain pens and got to writing on Clairefontaine 90gsm paper. Lots of writing. So much writing. Then, I set everything aside and didn’t think about these inks for a couple of days. Finally, I wrote just a little more with each of the inks to see if my initial thoughts changed with a little time and separation. Third, let me spoil things just a little here. 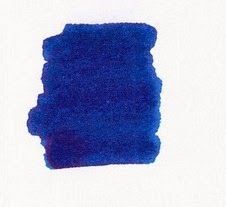 You could, seriously, choose any of these four inks and be pretty happy. They each write wonderfully, flow is great in the Metropolitan, and the color and saturation are right up there with some of the best inks I’ve tried. 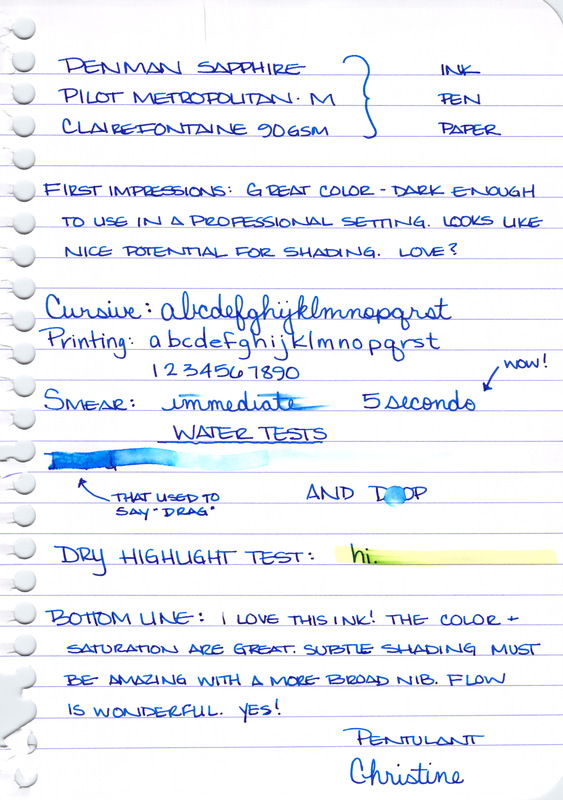 These are truly four fabulous blue inks. Smear Testing . . . I wrote a little and then smeared across the writing. 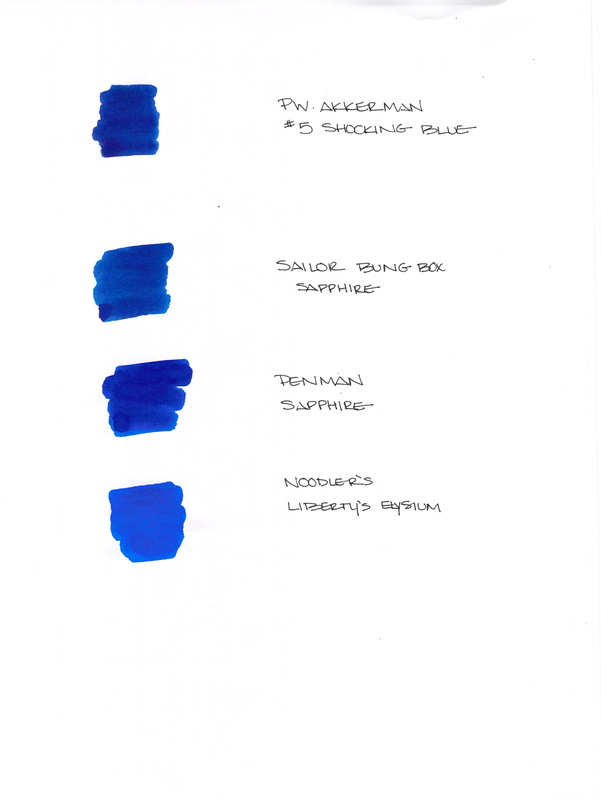 Noodler’s Liberty’s Elysium (number 2) and Penman Sapphire look like the winners here. Then, I scribbled back and forth over the same area three times and smeared that – same winners. Water Smear Testing . . . I wrote, let it dry, and then went over my writing with a dampened cotton swab. 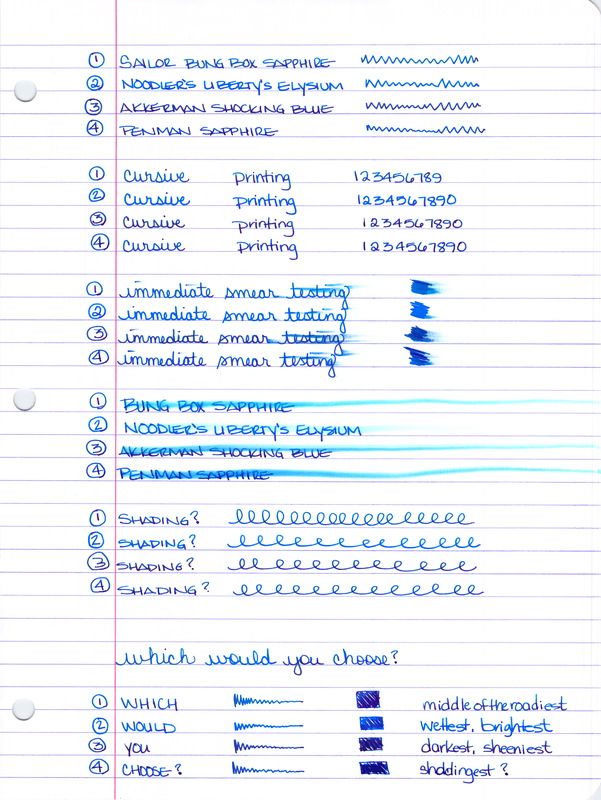 The clear winner is Noodler’s Liberty’s Elysium. I’d say that the other three inks are about even in their resistance to water. Sailor Bung Box Sapphire Review . 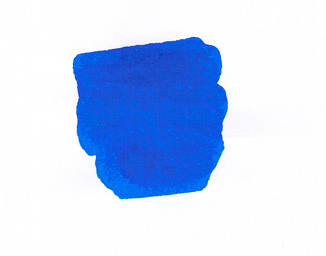 . .
A solid medium blue, maybe not as saturated as the others. Not especially bright, no muddiness to the color. Just straight up blue. Some nice shading. Would love to give this a go with a super broad nib because I’m seeing some pretty nice red/purple sheen in there, too. And it’s pretty smeary when tested with a highlighter. 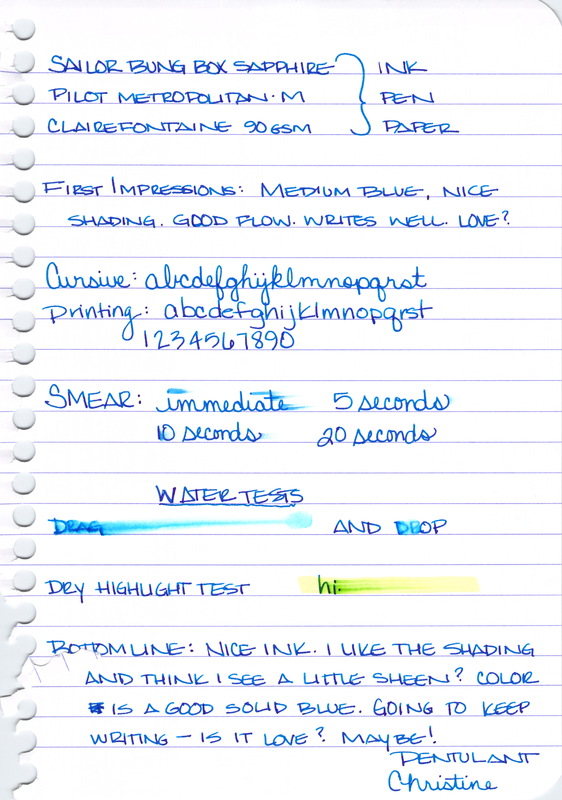 Noodler’s Liberty’s Elysium Review . . .
Not a lot of shading and definitely no sheen. 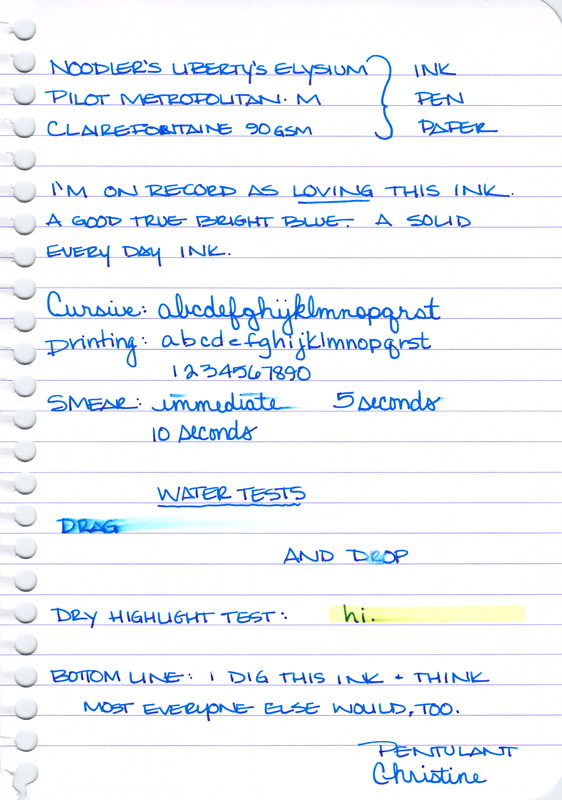 It’s interesting, I wrote in my initial review that this ink is supposed to be water-resistant. I’m positive this writing and the one above had been sitting for at least ten minutes when I dropped the water onto it. Maybe it needs to sit even longer? It’s also supposed to be semi-bullet-proof. I’m not sure exactly what that means, but there you go. My thoughts on Noodler’s Liberty’s Elysium . . .
PW Akkerman #5 Shocking Blue Review . 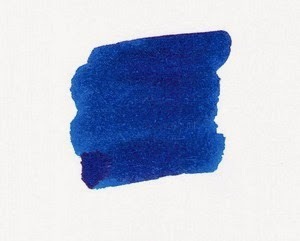 . .
A rich, dark, blue with a reputation for some fantastic red sheen. Good shading . . .
Nice sheen . . . It does just ok on the smearing tests . . .
Yikes. 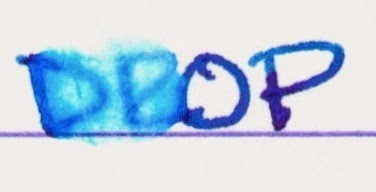 I wrote the word “DRAG” and then dragged a wet cotton swab over the writing after the ink had dried. Crazy, right? And given the above, the below highlight test probably isn’t too much of a surprise. My thoughts on PW Akkerman #5 Shocking Blue . . .
Parker Penman Sapphire Review . . . True blue, dark blue, saturated blue. Lots of shading and color variation . . .
Great dry time . . .
Not so great water-resistance . . .
Just ok on the highlight testing . 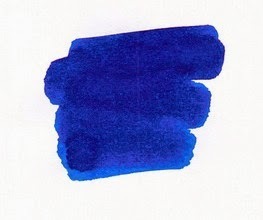 . .
My thoughts on Penman Sapphire . . .
i love everything about it – the writing experience is different from all of the others – maybe a little bit more lubrication than the others? That’s it (enough already!) for today. Just one quick question for you: which would you choose? In the meantime, here are links to some full-size images for you (they’re big!) . . . 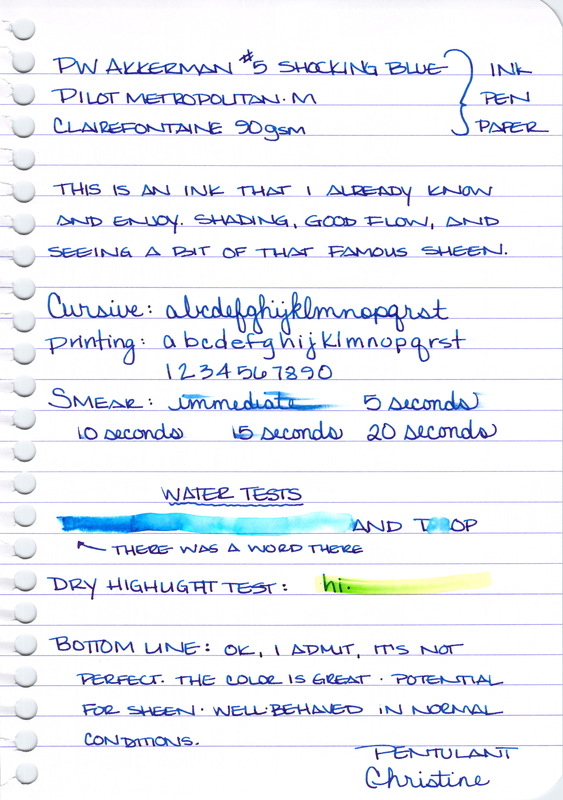 This entry was posted in INKS and tagged akkerman, blue, ink comparison, noodler's, penman, sailor, sailor bung box by Christine (Pentulant). Bookmark the permalink. I like 1 and 3 the best. Happily, I have a bottle of each. And 100 carts of Penman Sapphire. Liberty's Elysium, I dunno. Not really enough shading to suit me, I think. Wow, great review! Thanks for doing it! I love all these inks for different reasons. I think the semi bulletproof thing with the LE is that some will wash away and what's left is permanent on paper. Maybe not enough water?